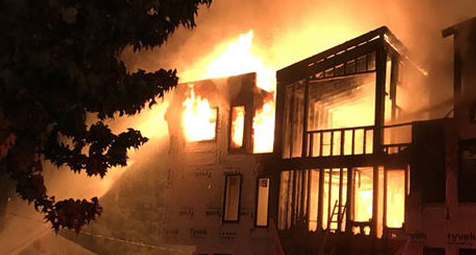 Last Thursday, in Wallingford, Washington a construction project of townhomes went up in flames in the early morning — the developer believes that he knows who is to blame. Builders that neglect the Best Fire Practice in today's Building Industry who experience this kind of loss need to rebuild with less risk. Another Fire in wood frame under construction on Tuesday, September 18, 2018 05:45AM South Los Angeles. A fire engulfed two buildings that were under construction Tuesday morning in the Green Meadows neighborhood of South Los Angeles, prompting a massive response from firefighters. The inferno was reported shortly before 3:30 a.m. in the 1100 block of 95th Street, according to the Los Angeles Fire Department. The need to fire defend 100% of the lumber in high density wood framed infill just became even more important as it becomes more risky to build with raw lumber. This weeks 2 additional fires now raise the count to 29 projects destroyed by fire in 2018. The builders that think its still worth framing high density or mass timber with no fire protection are at higher risk in the eyes of insurance risk managements teams. The solution is out there, the most cost effective fire protection the building industry has ever seen is now available nationwide by using M-Fire's Mighty Fire Breaker Job Site Spray.